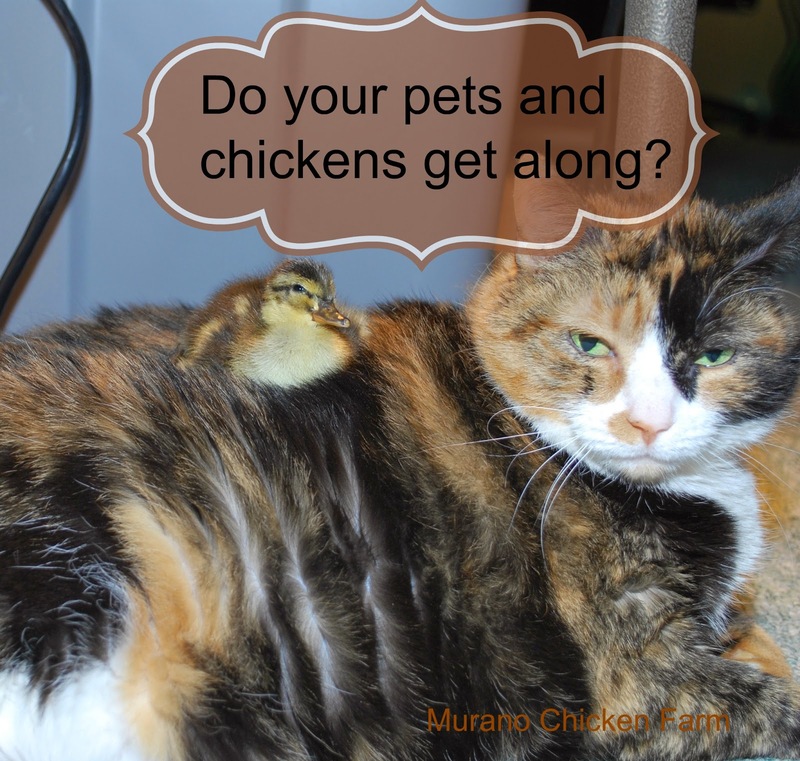 Do your pets get along with your chickens? We've had 6 different pets since we got our first chickens. 3 dogs and 3 cats. Each animal has a different personality and therefore a different way of reacting to chicks or chickens. Take Anastasia Bug for example. (she's the calico in the picture) Bug will sniff a chick if it's near her, but mostly she just ignores it. I have numerous pictures of her with chicks and ducklings. Sometimes they even snuggle up to her for a nap. She couldn't care less! We had a Siamese mix named Maggie that was curious about the chicks, but would never do more then pat them a little with a soft paw. Then there's the cat we got after Maggie died. Trixie. She's a Bengal. High prey drive. We have to keep her completely away from the chicks or they would be no more! She has even figured out how to open the sliding glass door to get outside and chase full grown guineas! Bad Trixie! So as you can see, each animal has a different reaction to the chicks/chickens. Cat's however, aren't as easily trained as dogs. Can pets and chickens get along? We have 3 dogs. 2 were full grown when we got the chickens. The third one came to us when she was about 8 months old. One of the older dogs is a Jack Russell terrier. She can not be trusted around chicks! However, she's scared to death of them once they hit about 6-8 weeks of age. I guess they get too big for her. No amount of training has helped with her, she see's a chick and tries to pick it up. Bear is a Shiba Inu and it's in his temperament to be gentle. He just ignores all the poultry. Except the geese. If the geese are sitting by the back door he stands there paitiently and waits for me to shoo them away before he'll walk out. Our other dog is a boxer/Australian shepherd mix. We got our first chicks and guineas when she was about 10 months old. She's grown up with them and is pretty good with them. Occasionally she'll run through a pack of guineas just to see them fly, but she would never hurt them! She takes pride in chasing away the chipmunks and squirrels that come into the yard to steal any scratch the chickens might have missed. She starts freaking out and ringing the bells to go outside any time the guineas send out their "alarm". She's even trapped an opossum that was trying to get into the coop, and held it there till I came out to deal with it! She's also been known to run past her electric fence line (ouch) to chase away a predator she sees in the woods. She's a great guard dog and loves just hanging out by the chickens. As you can see, each animal that we've had has a different reaction to the chicks/chickens. I think some of it's genetic. Some of it is training. So my question for you is....do your pets and chickens get along? I have no other animals, just the three hens. One cat just sits and looks as the chickens walk by, ignoring the cat. Another cat stalks them but appears to lose interest. I think they are too large for her. One day, I left a chick on the lawn for about three minutes or less. Something under the house took the chick. We have leash laws, but people ignore it. One dog tried to bite me as I ran out to my hens' alarms and squawks. I reported it to Animal Control and never saw the dog again. Another dog caught one hen when she went next door. She lost her tail feathers, but the dog ran away, never to be seen again. A little yappy dog would harass my hens even in their pen, running and jumping against it and barking. I think the dog only wanted to play, but the hens are not up to that kind of rough play or continual barking. I want to get a puppy and let it try to play and get pecked. Then it will never bother them again. Puppy's are easier to train then older dogs. Thankfully none of our neighbors dogs come over very much, and when they do they ignore the chickens. That little yappy dog would have worried me. Even if it only wanted to play, it would have been too much for a little chicken! Hopefully he'll stay away now! 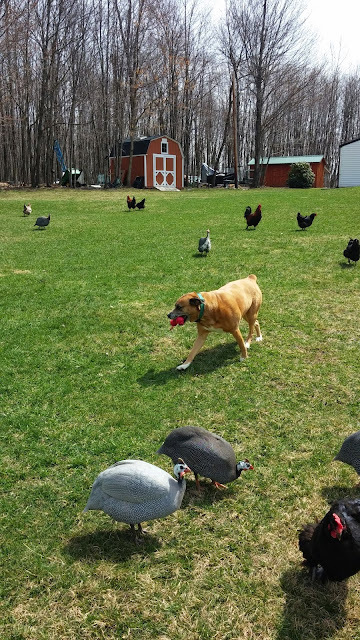 My pitbull mix Keela totally ignores the hens, but two years ago got a couple of chicks. The hens should stay in the barnyard, but six of them fly over into the yard to mess with my garden on a daily basis in the summer! I attribute her gentle behavior toward the hens to her seeing me with them daily. They're part of the family. The baby chicks are more foreign to her. lol...I have a hen that gets in the garden all the time too! So bad! That makes sense about the chicks. They also act a little crazier, it might trigger her prey drive a little. Almost like seeing a mouse. We have a couple of puppies right now who we are training to not chase the chickens. I cannot wait to have them mellow out a bit ;-). Thanks for sharing with us at Simple Lives Thursday; hope to see you again this week. You've got the right idea! training them as puppies is much easier then trying to train them as adults. Good luck! We are totally adding a puppy in the near future. I am sure it will be entertaining training it since we have goats, ducks, and chickens! Thanks for sharing on Homestead Blog Hop. Hope to see you this week! Just wait till the puppy decides to go swimming with the ducks! lol Ducks don't like other animals in their poo! Should be amusiing!